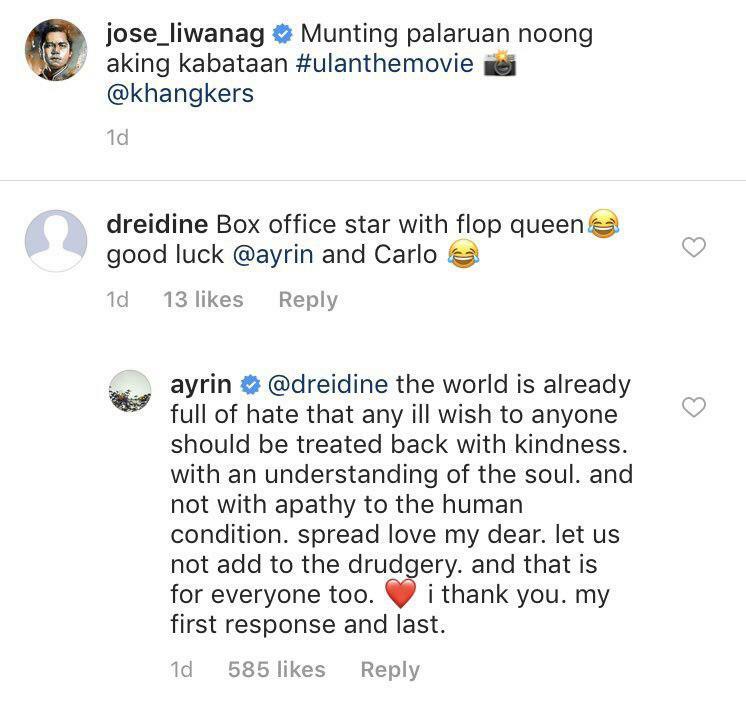 Kill 'em with kindness, direk Irene! Nadine Lustre is starring in her first solo film without onscreen and real-life boyfriend James Reid. In the film Ulan, which is said to be a movie about self-love and acceptance, Nadine is set to star alongside Carlo Aquino, among others. In a recent Instagram post by the Kapamilya actor, Carlo shared a movie still of him and Nadine and captioned it with, "Munting palaruan noong aking kabataan." While the pic received mostly positive comments about the new pairing, an Instagram user thought otherwise and wrote that Nadine was a "flop queen." "Box office star with flop queen. Good luck @ayrin and Carlo," the Instagram user said. Ulan director Irene Villamor (Sid & Aya and Meet Me in St. Gallen), who was tagged in the comment, went on to respond to the basher with a heavy dose of kind words. She said, "The world is already full of hate that any ill wish to anyone should be treated back with kindness. With an understanding of the soul. And not with apathy to the human condition. Spread love my dear. Let us not add to the drudgery. And that is for everyone too. I thank you. My first and last response."